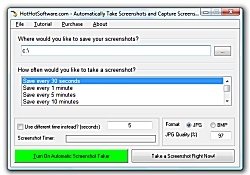 Automatically Take Screenshots and Capture Screenshots for Windows PC Software! Get it now! Only $29.95 U.S. (Regular $49.95 US!) for a limited time! Easily create walk-through demos for products or services that you offer! With this screenshot maker, you can easily set the timing interval that you want, and then the software will automatically take screenshots for you! If you are doing any kind of work, and need backups! Then this software is for you! Simply specify the location where screenshots should be saved, and the software will do the rest! If you want to monitor access to your computer while you are going, to make sure no one else is doing something they shouldn't be! Then this software will do just that! You can make the screenshot software run in the system tray, so that it is not obvious that it is running in the background to other users! It is fast, easy, and saves you time! 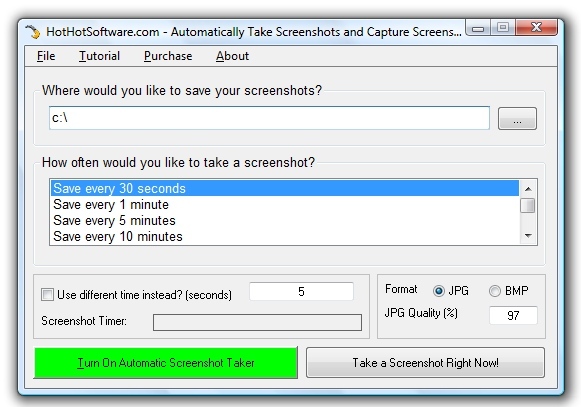 Start using this software now to take screenshots of your pc, and try it out now!